Passwords! It’s a love, hate relationship. We need them to secure our stuff, but they sure are a pain to try and remember. We need them to log onto our computer and then to access our email account, our online banking, and a multitude of other web sites that ask us to create a password. How can one person with so many other demands and tasks to perform keep track of all of these different passwords? Having worked in IT for over 15 years, I’ve seen it all. Some people use a single password for everything. Some use a few select passwords. Some choose a password and just change a number or something else, but basically it revolves around the same content. Some try to choose different passwords for each site but forget what they are or worse yet, write them all down in a notebook or piece of paper that a stranger could easily find and then immediately have access to all your accounts! There is a solution! Ideally what we want to do is have a complex password that is unique for every web site or other platform we access. We also want to be able to easily type this information without having to remember it. This is no easy task, but there are tools to help. Some tools are even FREE! Before we get into the free stuff (everyone loves free stuff! ), let’s go over an example of a bad and then a good password. We’ll use our online banking website for example, we have a username, probably which is our email address: user@emailaddress.com and then a password. A bad password would be something like our child’s name, our date of birth, or any information that could be publicly accessible. In this day and age of social networking where personal information flows easily, it wouldn’t be hard for someone to put together some good guesses what your password might be. An example of a good password would be this: o7fM40FUmPZDSoHOrSoy. I know what you’re about to say, it’s too long to remember, and I don’t want to have to type that in all the time. I agree 100%. This is where the free stuff comes in. 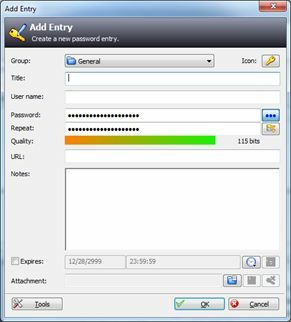 The nice thing about KeePass is that it helps you create unique passwords for each web site you use that are highly secure and it stores them within a secured database. Otherwise, it would be impossible to have such strong and unique passwords for all your online accounts and remember such things. 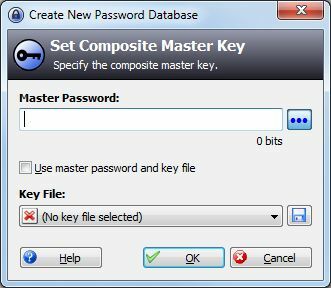 Here is where you will enter a Master Password that will unlock your Password Safe. This should be something you’ll remember but also secure enough that people won’t be able to guess it. One solution for coming up with a good password is taking the first letter of each word in a sentence like this, “I live at 335 Mayberry Street” would yield a password of Ila335MS. This way it’s very random, includes upper and lowercase letters and numbers and not easily guessable. Once all of your information has been added, be sure to click File and then Save. Now you have all of your passwords in a highly secure and encrypted database, safe and sound. When you visit a website needing the info, you can simply open KeePass and click on the username and password of the specific entry and Drag and Drop it onto the web page so you don’t even need to type it! If the Title in KeePass matches the title of the website you are visiting, you can even use the Auto-Type to automatically populate this information! Rob at Inline Tech is a 15+ year technology veteran in the IT industry. If you have any questions or need computer repair work in the New Hope area, feel free to contact him via his web site at www.inlinetech.com.